Peasmarsh Junction is where the Cranleigh line met the main Waterloo to Portsmouth line. A few hundred yards further on towards Guildford, the Gatwick line also joins the main line, causing some confusion, as they both had signal boxes named 'Peasmarsh Junction' for a while, until the Branch's box was renamed 'Peasmarsh South'. 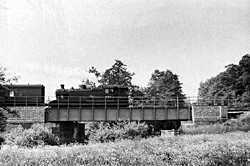 In 1926, 'Peasmarsh South' signal box was demolished, and the 'double track' junction was changed to a single track, leading off on the branch line to Horsham. In late 2004 and early 2005 The national Trust and the local council renovated the track bed from here to Bramley station. (photos to follow soon) Trees have been cut back, and gravel laid, and planning permission is being sought to rebuild the bridge across the river wey. At first glance, no evidence of the branch line, only the road bridge and weyside hut give the location away. The photo is taken with our back to Guildford, with Portsmouth through the bridge. The story is the same from the road bridge, the signal box has gone, so has the house just to the right and behind. Leaving little evidence of the junction. Closer inspection shows some lengths of line where the signal man's crossing was. 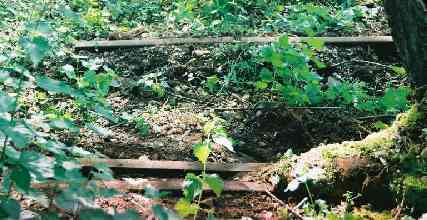 There are slight remains of rotting 'walk boards' but these pieces of line were left, complete with rail chairs. A tree has grown around the nearest two, fixing them in place for the foreseeable future! 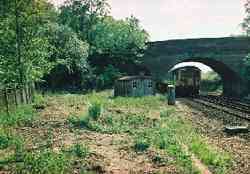 The Cranleigh Line was single track, with passing loops at most stations. 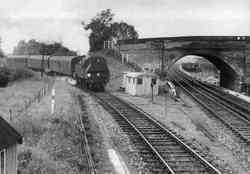 Because of this, the trains were given a 'staff' at various locations allowing it to travel along that section of line. So two trains could never have a staff for the same section of line, supposedly making collisions impossible. 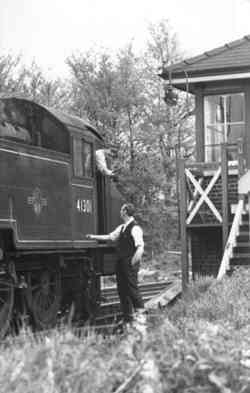 Here the driver seems to be giving or collecting a staff from the Peasmarsh signal man. 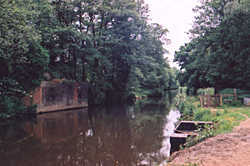 Just south of Peasmarsh Junction, the line had to cross the 'River Wey'. Although the bridge itself was removed shortly after the closure of the line, the two brisk retaining walls can still be seen on either side of the river.